Callie Grant founded Graham Blanchard Inc. to create children’s books for growing up in God by working with an extensive network of artists, parents, pastors, teachers, and children. The company, which release its first titles in 2013, is the culmination of her experience in the publishing industry paired with a strong calling to help families know God’s love and nurture their faith through reading together. while playing on the beach as a child. Tugeau also illustrated Graham Blanchard’s All of Me That You Can’t See released in 2013. His faithful accomplices and primary inspirations are his wife Nicole and their three young children. This book took me back to my own memories on the beach. It is a toddler board book that is very fun to read and use motions for the actions it describes in the text. I could easily relate to the book with my memories from the beach especially the line, "A salty spray surprises my mouth." I remember the first time at the beach how over powering the salt water truly was. 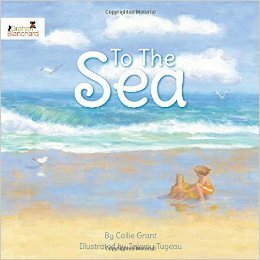 Each page takes you to a different sensory or memory from the beach from birds, to waves, to building sand castles. This book is great to discuss all there is to do at a beach before going to one or discussing all the fun that was had at the beach. The illustrations were created with water colors and it created a warm feeling just like the beach. The ending of the story reflects at being thankful for God creating beautiful fun beaches and there is scripture on the last page, Genesis 1:31 "And God saw everything that he had made, and behold it was very good." The age recommendation is 0-5 and my 4 year old seemed to enjoy it but my 7 year old really enjoyed talking about what she likes about the beach and comparing and contrasting her likes to some of the highlights of the book. I received a free copy of this book in exchange for an honest review. I was not paid for this review and all opinions are 100% my own. Please enter the giveaway below through the easy Rafflecopter form. I would love to give this to my friend's son! I'd give this to my niece and nephew.